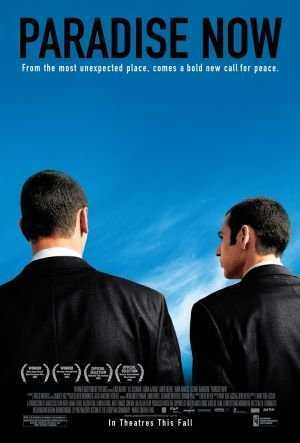 Paradise Now is a movie about suicide bombing mission that is planned to be undertaken in Israel. The main characters of the movie are Khaled, Said, and Suha. Khaled and Said are friends from childhood and mechanics who live in Nablus Palestine and Suha are their friends too. The boys lead a life of poverty which is attributed to Israeli occupation. Khaled and Said are recruited for a suicide bombing mission in Israel; they are convinced to blow themselves up as it was a religious duty. So, they told them that they would be heroes and it is the right thing to do, and it is something will make a change. The handlers brainwashed by telling them that they will go to heaven directly and have their families taken care of. The organization facilitates them by offering training, clothes, encouragement and video shoots to be shown after their demise. Khaled is excited about doing this mission, and he seems to believe the promises he is given especially was going to a real heaven. However, Said is hesitant about doing this because of the love he has towards Suha. Finally, they got ready, and they went to Israel to do their mission. However, there was something went wrong because of the police and they could not complete the mission. Khaled returned to the handlers, and Said was lost. The handlers thought that Said betrayed them and they left their place together with Khaled as they thought that he was going to tell someone about them. Khaled did not believe that Said betrayed them and he went out to search about Said. At that time Said was looking for Khalid and the handlers, he bumped into Suha by chance and she knew there was something wrong with him. When Said told Suha what they were into, she tried to talk them out. Suha, a Palestine-born in French and raised in Morocco had a different perspective on suicide bombing, as she was not the right thing to do as it only serves to increase the cycle of violence and number of innocent victims. Suha failed to convince Khaled and Said to abort the mission as they returned to the handlers who approved their request and sent them back to Israel with the bombing belts. Suha was trying hard to prevent them, but they ignored her words and went back to Israel. At that time, Khaled was really sad and afraid, and he kept thinking about what Suha said. However, Said was hopeless, and he just wanted to do the suicide bombing as soon as possible. After arriving in Israel, Khaled told Said to go back to Nablus, because he thought of Suha’s words as he realized that she was right. Khaled kept asking Said to go back, but Said refused. In the end, Said lied to Khaled and told him that he is going back with him. However, Said put him in a taxi car and let him return alone. Khaled was crying in the taxi car, and he knew that Said would do the wrong thing. Said, left alone in Israel and finally, he did the suicide bombing with closed eyes at one of the buses. The movie was good, and it shows how people can easily be brainwashed into believing some things they have no idea of. It also helps in enlightening about the conflict between Palestine and Israel. First, it changed my idea of the Israeli occupation. I did not know that Israel was not equal to Palestine. After watching the movie, I realized how unequal Palatines are treated and exposed to a hard life. While Israel is a beautiful country with good educations and jobs, Palestine is poor and destroyed as a result of the Israeli occupation. Also, this movie changed my mind about the idea of revenge. Though the Palestinian people lead a hard life as a result of Israel occupation and need to do something to change the situation, suicide bombing and another form of killing is not the solution. Suicide bombing only results in revenge as the innocent are the ones hurt most and does not bring a lasting solution. I think the best thing for Palestinians to do other than revenge is to take a new approach to the conflict. Focusing their energy in investing in good education will help improve their live making them to be on par or stronger than the Israelis from inside and outside. Paradise Now is a movie about suicide bombing mission that is planned to be undertaken in Israel. The main characters of the movie are Khaled, Said, and Suha. Khaled and Said are friends from childhood and mechanics who live in Nablus Palestine and Suha is their friends too. The boys lead a life of poverty which is attributed to Israeli occupation. I think the best thing for Palestinians to do other than revenge is to take a new approach to the conflict. Focusing their energy on investing in good education will help improve their live making them to be on par or stronger than the Israelis from inside and outside.